Painter Bill Gittins, a KRCB board member, is featured online today at the KQED website, talking about his experience during the Tubbs fire that burned so many homes in his Fountaingrove neighborhood. “I had completed about 35 new paintings for ArtTrails over the last several months, and that was while I was doing some commission pieces at the same time,” he told KQED reporter Joshua Bote. 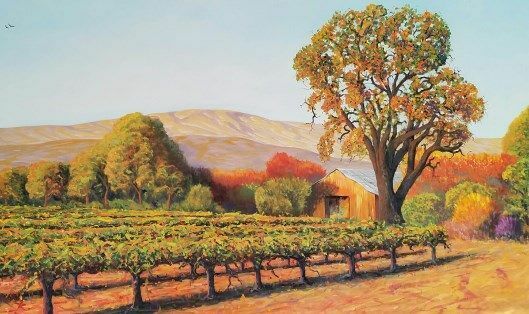 "Gittins has had such a history with the open-studios tour that one of his paintings — the serene Sunset Along Poppy Creek— was featured on the cover of ArtTrails’ collector guide last year. He was planning to display 60 paintings this year. "And then, he says, they're gone." "With thoughts of the future, Gittins remains resolute. 'I want to make my paintings represent Sonoma County as I remember it,' he says, 'and as I know it will become.'"